It was only a little over 12 months ago that we gracefully boarded the Savannah barge to casually cruise the waterways of the Canal du Midi in the south of France. Could we really be lining up for this experience once again? The simple answer is “you bet”. Feeling as though we knew the ropes a little better, we were ready to fully embrace another hedonistic week of fine dining, exceptional regional wines and the oh so slow method of traversing the beautiful French canals. She’s there waiting for us like a loyal friend, welcoming us on board with a glass of French champagne. At 39 metres long and just over five metres wide, the Renaissance, part of the European Waterways luxury fleet, and our home for the next week dominates the landscape. Despite being still tied to the bank, that cold glass of bubbles triggers an immediate change in mindset. The heart rate slows down, my mind stops racing. I head for the side rails and simply gaze out, savouring this moment. I resist the urge to go and check everything out. I know there’s plenty of time for that. WATCH OUR VIDEO BELOW FOR THE HIGHLIGHTS OF A WEEK ONBOARD. YOU CAN TURN UP THE SOUND ON THE BOTTOM LEFT. Our week-long journey commences in Montargis, a small village on the Briare Canal, about an hour and a half south of Paris. As the crow flies, it doesn’t seem far, but here on the quiet waterways of the French canals, it may as well be a world away. The weather is warm, allowing us to make the most of everything the Renaissance has to offer. We are joined by four other guests, a couple from California and another from Tennessee. Both are new to barge holidays. One has done river cruises so is keen to be able to compare the two. The coming together of strangers in such an intimate environment can pose some issues. Mostly, however, everyone is keen to get on, to chat and have a great holiday. If not, the barge has enough areas where people can take some time out. By the time we arrive at our final destination a mere 52 kilometres away, I’m sure we’ll be wishing we could stay another week. The experienced crew on the Renaissance are used to all the different iterations of guest dynamics. To help everyone ease into the journey, we take a walk into Montargis before settling in for a sumptuous dinner back on board. We stroll around the eerily empty streets as if it’s our own. It’s Sunday, and the French are mostly indoors now in the late afternoon. They live at a much different pace. No shops open all hours of the night and indeed not many even open now. Flower pots are bursting with the colours of summer. Dangling their green ivy-like vines down the metal railings they turn an otherwise ordinary bridge into something special. We will only see a few of the 131 bridges that criss-cross the hidden canals of this cute French town, but it’s enough to delight us all the same. We pass a church or two, the oldest praline shop in the area and several more buildings of importance before it’s time to leave. Another friendly greeting back on board over (we’ll get used to plenty of this), it’s time to settle ourselves into our cabins before dinner. 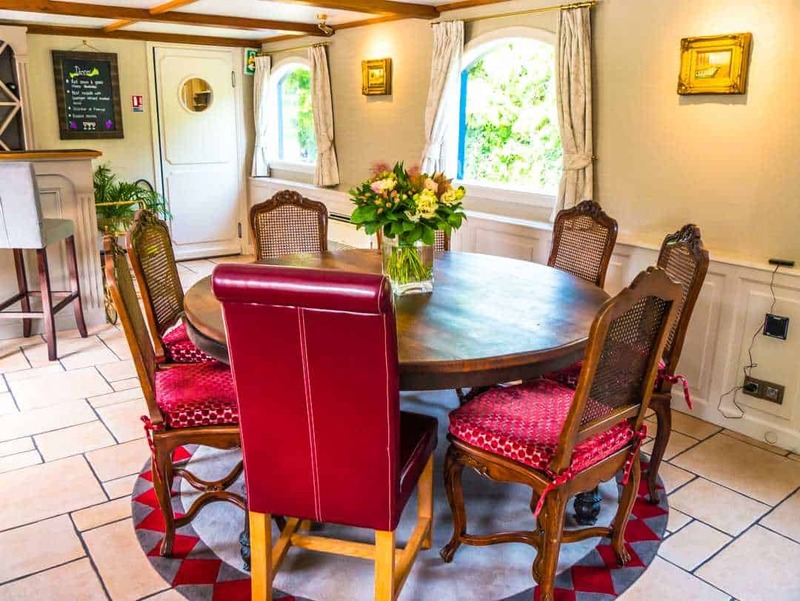 Notable literary icons Moliere, Voltaire, Dumas and Hugo provide the inspiration for the names of the cabins, a luxurious mix of soft grey carpet and mahogany furniture. It’s a stark contrast to the luxury barge’s exterior, a robust, in-your-face royal blue with pops of white and red. It makes her quite a celebrity on the waterways. A full-size, well-equipped ensuite bathroom, excellent storage and generous room sizes mean these cabins are at the high end of barging luxury. 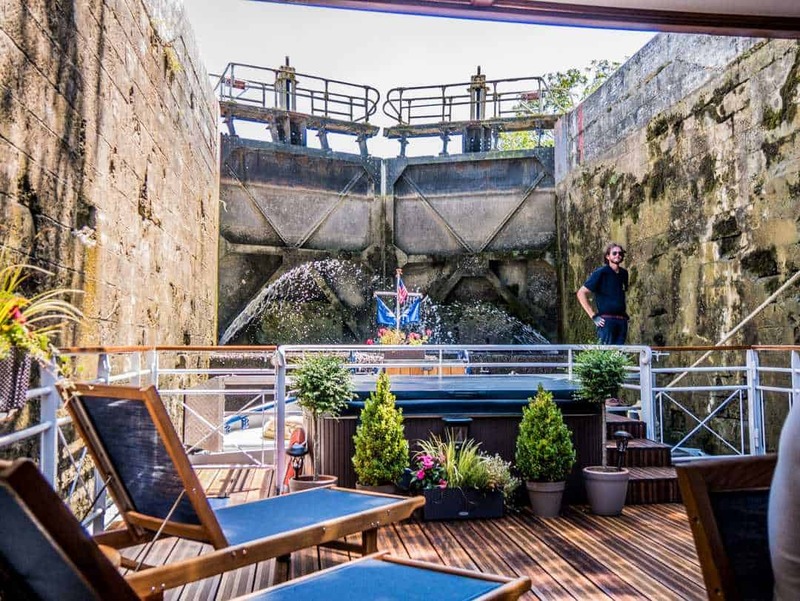 It’s one of the features that set the Renaissance apart from many other hotel barges on the French canals. If there wasn’t so much to get involved in outside I could quite easily imagine a guest or two hiding away here for a while. As motorhome travellers who are used to doing extensive road trips through Europe, we love this kind of slow travel. Add in another love, France, and all that it has to offer, and a barging holiday on a French canal is the perfect combination. Whilst someone else does all the hard work of moving this 250-tonne lady through the canals, we get to absorb the picture-perfect French landscape. The Renaissance has been built to enhance this lifestyle. Under the shade of an outdoor roof and with the summer sun beating down on the fields of corn, we sip a cheeky rosé and wave to those that pass us by. With lounging deck chairs and comfy bench seats, finding a place to settle in and watch the world go by is easy. At night, watch the sun go down whilst sitting in a hot tub, taking pride of place at the front of the barge. Inside, the bright red leather lounge offers a spot of comfort in the air-conditioned surrounds. Here you can read a book from the library, or select something jazzy from the selection of CDs. It’s a novelty seeing CDs I have to say. At any time of day, grab a cold drink or innovative cocktail from the eager staff who are always willing to make your stay here a memorable one. I learned that I actually did like gin. When I said to our hostess Claire to surprise me with a cocktail, within minutes she had conjured up a gin with burnt thyme and elderflower. In the evening, we’d sit in that comfy red lounge, sipping on a well-rounded cognac or a fiesty espresso martini. The distance we travel can be done by a car in a heartbeat. Even one of the bikes that are available for us to use, could see us get there in a few hours. Perhaps longer if, true to form, we keep stopping at local patisseries. At a rate of about six kilometres per hour, life on the Renaissance is anything but fast. It doesn’t need to be. It allows us time to take the bikes, not for the fast run to the end of the line, but to pedal, slowly, along the ancient towpaths. Once used by horses to tow commercial barges along the canals, today they only carry locals and people like us. As we disembark the Renaissance at a lock arranged with the captain, we head off into the breeze, paddocks of corn and wheat by our side. With plenty of time until we need to meet the barge at our nominated lock, we’ve got time to venture into local villages too. Small whitewashed cottages, many with orange terracotta roof tiles, common in this area are dotted along the path. The lock master’s houses are my favourite. Often two-story, often covered in vines and always with the directions to the previous and next locks, they hold a special place in history. The role of the resident lock master is a dying trade. For centuries, the role has often been handed down from generation to generation, each new lock master proudly taking on the important role. The canal system operates like clockwork and the role of a lock master was considered vital to their safe and efficient operation. Nowadays, this job isn’t considered as exciting. The inherent isolation that comes with living out of town, at a lock, suddenly doesn’t seem as welcoming. The cost of employing lock masters has also had an impact. It’s quite common now to see a lock master driving in a tiny car along the towpaths. It’s a world away from the horses that were once used. Today many lock masters manage a multitude of locks on their own. Diners sit at restaurants that appear as though they are falling into the water, doing what the French do best, a long lunch. At any other time, I’d stare wistfully at them as I passed them by, or opt to join in. There’s no need for feeling wistful aboard the Renaissance. Instead, we are the envy of those we pass as we sit around the heavy stone table, deciding whether we should have another cold glass of Riesling or the impressive Margaux. Dining is a ritual here. 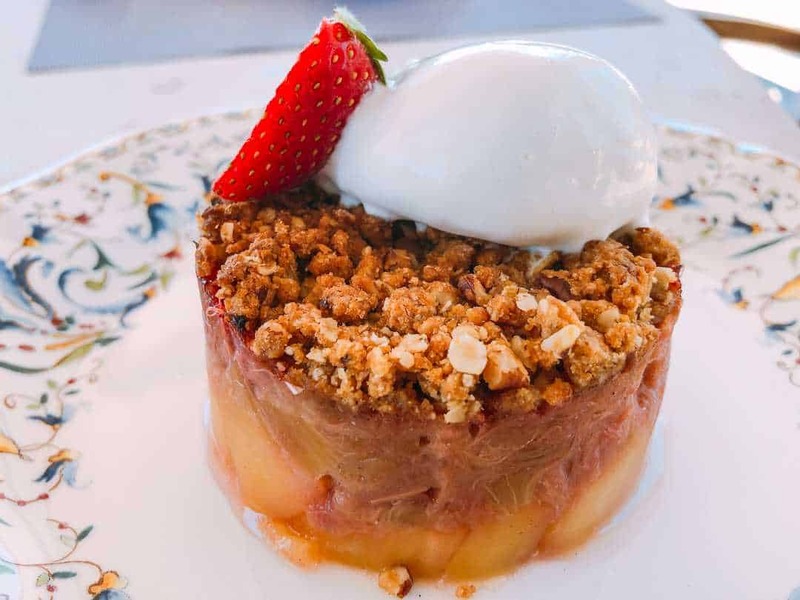 With three fully a la carte meals with many courses each day, there’s plenty of room for experiencing the flavours of the region, and absolutely no room left in your stomach by the end of it. The quail cooked in red wine goes perfectly with my Margaux and the veal roulade with tarragon-infused mustard sauce has me wanting more. Our chef, a former hairdresser with a love of French cooking, “moved to Europe, started as a hostess on a barge, went to school in the winter and learned from other chefs”. Now, she takes the guests on a culinary adventure involving some incredible French favourites and a few modern twists to keep everyone interested. Over the course of the week, we will eat (officially) around nine entrees and desserts, ten mains and 15 different varieties of cheese, notably aged. We’ll be introduced to eight new white wine labels from the local area along with nine reds and one rosé. Corks were popped off untold bottles of champagne. I stopped saying how nice they were after the first few labels. It’s hard to find a bad French wine, and those served on the Renaissance have been carefully selected. An eight-course degustation at Michelin starred Auberge Les Templiers was also a highlight. Breakfast is a casual affair, served buffet style, but with the option for a la carte too. It’s hard to go past the fresh, flaky croissants. France is the only place in the world where even the worst croissants are still better than what most people produce. We’ve made them from scratch ourselves, on two occasions and are happy to tip our hat to the French. As hard as it might be to imagine, there is a great time to be had off the boat. A good barge holiday means taking in as much as you can of the local cities and villages. Under guidance from Renaissance tour guide and deckhand Matthew, who “enjoys meeting new people and showing them the countryside” we visit many places of interest. With a passion for history, he’s the perfect person to show us around. From the exquisite, over the top opulence of the Château de Fontainebleau, to the more subdued, everyday home of the Château de Ratilly, our love for chateaux is evident and remains one of our highlights. We head to the markets in Gien with our chef to buy our ingredients for lunch. 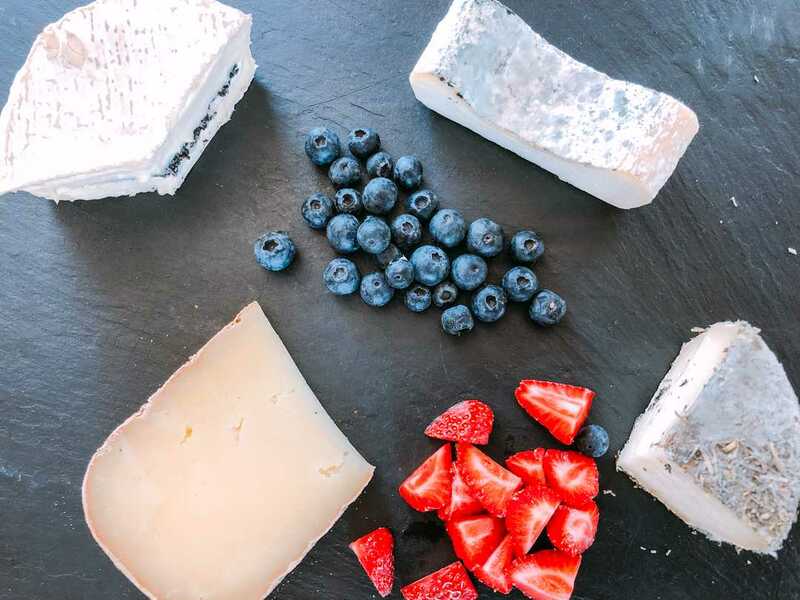 From tasting local charcuterie to freshly harvested snails, it’s a trip filled with the smells of spices, fresh seafood and the pungent cheese. In the middle of the market, we stand together munching on sweet strawberries that actually taste like strawberries, throwing the green ends on the ground like a local. 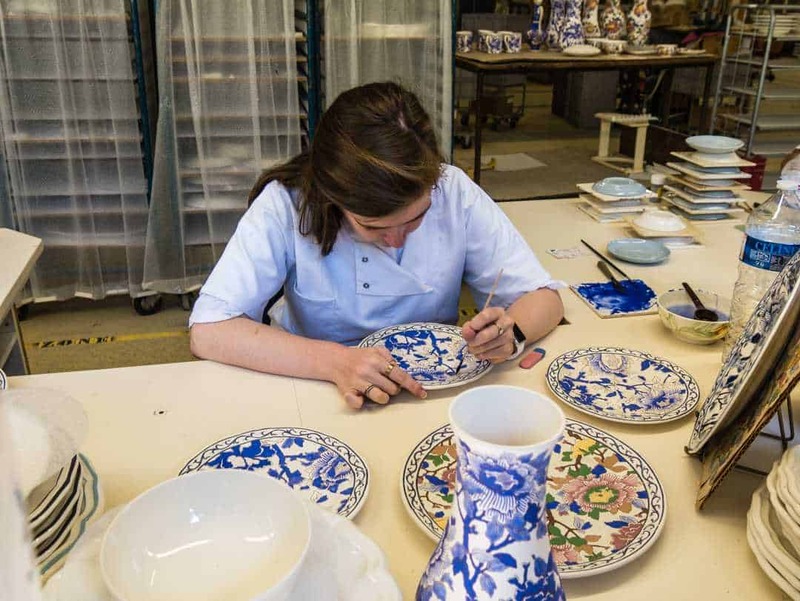 It’s hard not to buy as much pretty crockery as we can when we take a tour around the Gien crockery factory. A world-wide brand, these fragile pieces of art are greatly revered. In Montbouy we take an early morning visit to a 12th-century church, a favourite of the captain. With an enormous key in his hand, given to him by the town mayor, we take a private tour through the church and learn the stories of its past. At Rogny-les-Sept-Ecluses, we witness the incredible engineering of the 350-year-old, seven lock flight. A walk around highlights the magnificence of this structure and I wish that technology and other efficiency reasons hadn’t taken away the opportunity for us to climb it on the Renaissance. Not wanting to miss this opportunity, we put our drone up, so that we could marvel at this from above. Throw in cycling, cooking lessons and wine tasting and it’s any wonder some of the guests were heading for a lazy afternoon nap. We join in one of France’s favourite games and play petanque in the park, matching our unproven skills with the captain and the deckhand. In true Australian style, everything needs to be a competition. Soon we have the battle lines drawn. It’s France v Australia, a competition for pride and glory. We walk away victorious. Host Claire telling us “no-one has ever beaten Hadrien”, as she promptly fills our hand with a glass of chilled Lillet. The pièce de résistance is crossing the Briare Aqueduct. Noticeably similar to the Eiffel Tower, perhaps entirely due to the involvement of Gustav Eiffel, the Briare Aqueduct channels the Canal Latéral à la Loire over the Loire River. For 662 metres, the Renaissance passes over the Loire, fitting snugly in the frame of the high-rise canal. The wrought iron railings and ornamental lamp posts make this one of the most beautiful bridges in France. The water pushes constantly against the gates, willing them to be opened. As they finally are, the water rushes out with such force, as though it’s the first time it’s ever done it. Soon it will be quiet once more but first, we watch as the barge edges its way up, or down into the canal, I continue to marvel at how all of this actually works. Travelling on the Renaissance is an inclusive week which will either pander to your every need, if that’s what you want or similarly allow you some freedom if this is more your style. As strong, resilient, independent travellers, this was the one fear we always had. Anything over-organised is going to make our hands sweat. A careful blend of free time and organised events evens this out. On the day trips off the barge, however, there is still enough freedom. There’s no-one at the front holding an umbrella high in the air for everyone to follow. Equally, no-one gets the evil glare if you decide that you want to nip off and take some random photo (like I do) instead of listening to the 15th-century adventures of someone you don’t care for. Luckily, we loved it all and were able to get our own blend of independence. For those that go on holiday to have everything done for them, then this is the perfect barge holiday to be had. I linger over my final breakfast as long as possible, pulling apart my croissant flake by flake, hoping that this will delay my exit. As I’m contemplating whether to have an omelette or French toast, I see the luxury van that will be our transport back to Paris appear through the porthole. Determined not to give in, I push on, selecting another pastry from the mountainous pile in front of me. Surely there’s still something here I haven’t tasted? Maybe they won’t really make me leave? Perhaps it’s now time to tell the crew that we’ve all decided to stage a mutiny and we won’t be leaving after all? Eventually, I give in to what I’ve known all along. Like all good things, this magnificent slow barge holiday in France must come to an end. Au revoir beautiful Renaissance, the pleasure has been all mine. To go canal cruising in France, check out the range of hotel barges on the Barge Lady Cruises website. Here you can choose from the type of barge, the maximum number of guests and the location of the journey. From the Champagne and Burgundy regions of eastern France to Bordeaux in the west and the Loire and Canal du Midi further south, there’s plenty of barge cruises in France on offer. If you are looking further afield, there are options in Italy, The Netherlands, England and Scotland. The meeting point for the week aboard the Renaissance is Paris. The team at Barge Lady Cruises will communicate with you before your barge holiday, checking for dietary requirements, other health issues, meeting points etc. They will ask for details on the hotel you are planning to stay at in Paris. This is just in case there are changes to the meeting point or if for some reason you don’t arrive at the meeting point at the allocated time. They will have a contact point for you. From there, the team from the Renaissance take over, looking after everything you will need for the next week. Transfer to the barge is via a luxury, air-conditioned minivan. Depending on traffic, it will take 1.5-2 hours to reach the starting point. I hate packing but packing for a barge cruise in France is easy. Being on board the Renaissance is casual. During summer, the best things to wear are light clothes. You can’t go wrong with shorts, skirts, light trousers and short sleeves. Pack comfortable shoes for walking during the day activities and a pair of flip-flops or sandals for moving about the barge. Leave your heels at home, there’s no need for them onboard. Pack your swimwear for the hot tub and a hat as it does get really hot here during summer. Sunscreen and sunglasses are also a good idea. It’s a good idea to take something warm just in case the weather is unseasonable, or if you are cruising later in the season. If you are cruising in spring or autumn, your layers should get a little heavier and should include a warm jacket and some light wet weather gear. There’s not really any need to change for dinner either, but you can if this makes you feel better, or if you have the energy after a big day out. We always pack enough for this, but once the trip really gets going, everyone relaxes and doesn’t bother with a fashion parade. On the last evening, or if you do go to a Michelin starred restaurant, it’s nice to dress up a little more. As a heavy packer, this tip had to be learned the hard way. Whilst there is a significant amount of storage on the Renaissance, there really is no need to overpack. All of the luggage has to be placed in the minivan upon pickup as well, so smaller, softer bags are preferable. Other than your clothes, there’s really not too much else you will need. However, there are a couple of gadgets that I would suggest you take to make your life a little easier on board, especially if you travel with computers or other devices. We always travel with a universal adaptor. Wifi is technically available but the range can be somewhat limiting, especially with a number of guests on board all trying to access the bandwidth at the same time. We always travel with either a local sim that has data or mobile pocket wifi. This means you also have wifi when you are off the barge also. The Renaissance has electrical outlets in all cabins and in the main saloon area. They have 220-240 volts, but not 110 volts. It’s a good idea to carry a universal adaptor with you. Note: The Renaissance is not wheelchair accessible. The only steps on the boat are from the indoor lounge down to the cabins, or at the back to get to the wheelhouse if you plan on joining the captain for a while. A gangplank provides access from the land to the boat. Smoking is also not permitted anywhere on the barge. Each barge cruise is different and so attracts a different cost. For the most accurate and up to date pricing check the Barge Lady Cruises website. The cost of a week-long barge trip on the Renaissance is all-inclusive. This means that you don’t need to pay for anything else unless you have specific requests that are outside the general inclusions, which are already very generous. Note: Tipping is not included and is entirely at your discretion. Major airlines fly into Paris Charles de Gaulle (CDG), the main international airport in Paris. Other low-cost airlines like Easy Jet also land here. Alternatively, they use Orly Airport, the second international airport in Paris. Beauvais-Tillé Airport is used predominantly for low-cost carriers and Paris-LeBourget is a lesser-known airport. Check flight availability and compare prices on Skyscanner. Paris is also easily reached by train from other European cities or the UK. We use Trainline to buy our tickets online. The tickets can be accessed via their app on your smartphone. As one of the most iconic cities in the world, there is no shortage of places to stay in Paris. We stayed at Fertel Etoile, close by the Arc de Triomphe and the Champs Elysees. It is easily accessible by metro, with the Argentine metro station about 70 metres away. It is about 800 metres from the Arc de Triomphe and the Charles de Gaulle Etoile transport hub for metro and buses. Le Bus Direct which runs services from both CDG and Orly also stops here. The hotel is very clean with many of the rooms having been recently renovated. The reception desk is manned 24/7 and there are some very good cafes all within walking distance. In 2018, the pickup point for the barge cruise was the Hotel Westminster, a luxury hotel located in a plush area of Paris. Slow travel in France is the perfect way to see the country. Read comprehensive reviews, articles and itineraries from slow travel experts on barge cruises, motorhome and campervan travel in France. A comprehensive guide to taking a barge cruise on the Canal du Midi in France. All the tips, tricks and advice you'll need to have you inspired and well prepared for a barge cruise. Written by an independent travel writer with experience in slow travel on barges and motorhomes. Tips, costs, advice and an itinerary for how to spend 42 days driving through Europe in a motorhome by experienced motorhome travellers. France, Italy, Germany, Switzerland, Luxembourg and Belgium. A 20 day itinerary from Sens to the south-west of France. Highlights include Bordeaux, Cognac, Cap Ferret, Arcachon, Talmont-sur-Gironde, the Loire and the Lot River.